An adjustable magnet system is designed for easy and quick track assembly. Create your own racing empire with a wide range of cars and track sections! Before a race start, cars make a few laps to test the track. This slot car is not just a basic racing kit but a real action tournament. Use a virtual weapon to beat your opponents and come out a race winner! The set's track allows running up to 4 cars at a time. You can involve even more cars by adding an enhanced controller to arrange a hard-edged home competition. You'll need to upgrade the set to use older car models. 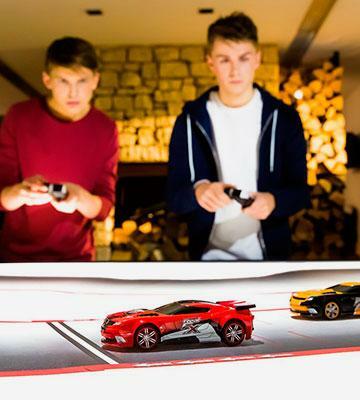 It's a peculiar racing set that combines classical slot cars and digital technology. 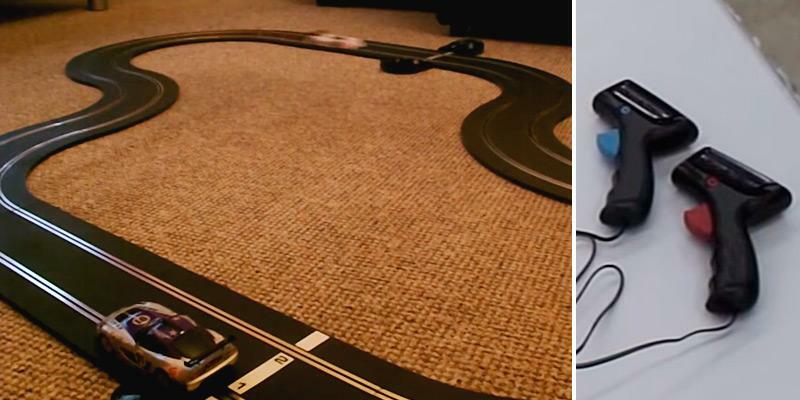 This Scalextric kit will let you overtake and block competitors on tracks and get a real enjoyment and fun. The stickers included in the shipping kit will let you decorate cars. You can also change the cars' style later through buying another set of stickers. The car's guiding blades may wear quickly, yet they are easy to replace. This slot car racing set is a top-notch pick for beginners thanks to a fuss-free track assembly. Besides, the kit is compatible with older slot car models, so true fans of racing will highly appreciate this advantage. The set includes a multifunctional joystick with an upgraded firmware. 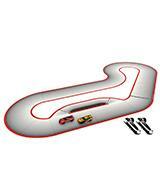 The Real FX kit offers a great number of track layouts. Rechargeable batteries are not included. 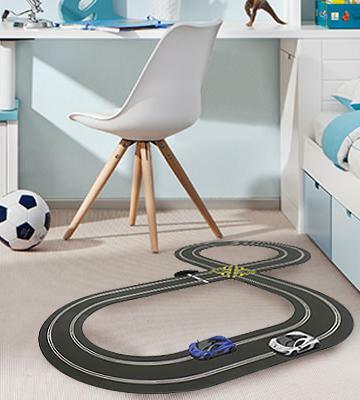 This superb portable slot car track can be easily and quickly set up anywhere in your room. 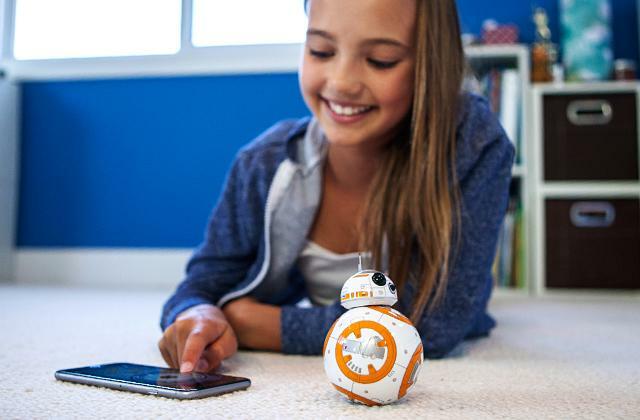 Enjoy hours of fun without the need to constantly recharge your batteries! The track design allows assembling and disassembling the set in no time. You can easily carry it to a park, a campsite or to your friend's house. The joysticks are for right-handed users only. 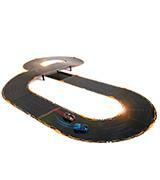 The deAO slot cars racing track is a wonderful choice for children as it's eco-friendly and incredibly easy-to-use. 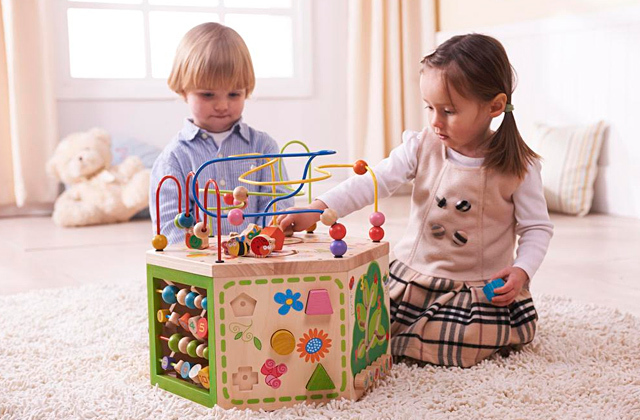 If your child is curious and fidgety, get this racing car set and amuse him or her with this game of skill. 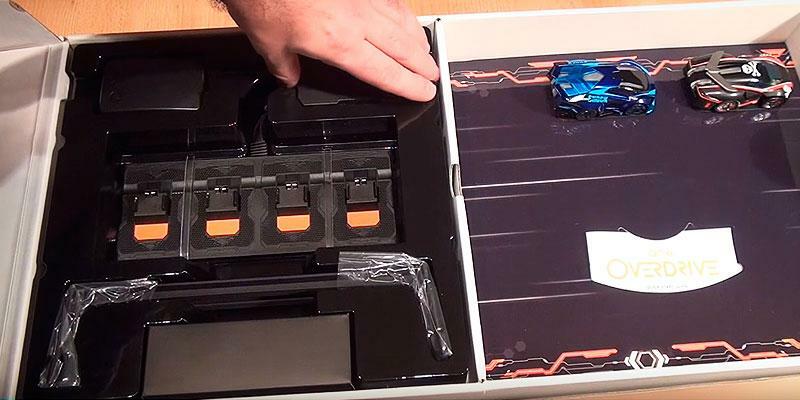 Let's take a closer look at the Anki slot car set. The Anki Overdrive is an improved version of the previous Anki Drive version. The track is composed of 10 pieces: 6 curved and 4 straight. The entire track size is 250 x 98 cm. 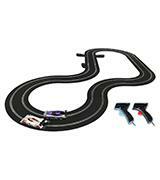 Various track combinations allow you to build up to 8 various layouts. Slot cars use traction magnets that keep cars on the track. Small sensors prevent cars from falling off on the curves of the track. 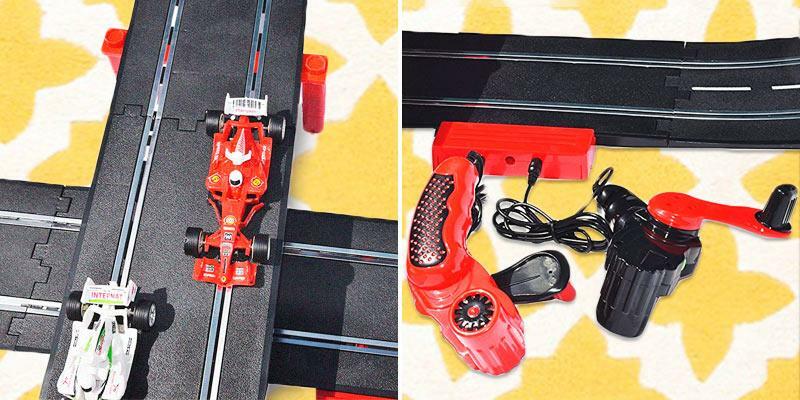 This digital slot car set requires no power supply. Therefore, it can be set up anywhere in your room for your convenience. On the manufacturer’s website, you will find a wide range of track components for endless building options to enjoy hours of racing fun. When assembling the track, it's better to focus on the track complexity rather than its size. Thus, to make your race more challenging, you may add rises and falls, twists and curves to the layout. In this review, we have considered Skull and GroundShock included in the Starter Kit. They are battery-powered, providing up to 20 minutes of continuous gameplay on a fully charged battery, which is enough for several races. Each car has its own specification and weapon arsenal. The Skull is less speedy but has more firepower armed with Plasma Cannon, Depth Charge, and Chaingun. The GroundShock, in its turn, moves faster, but it has less powerful fire attacks. It’s equipped with the following weapons: Electro Pulse, Charge Beam, and Core Inverter. 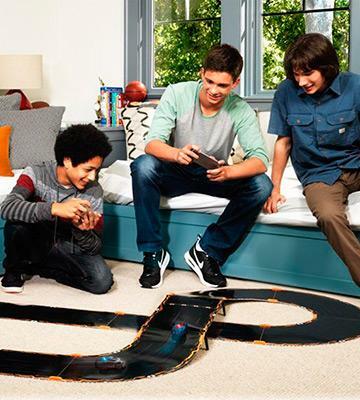 Anki slot car set uses wireless technology which makes it easy to operate. All you need is to download the Anki Overdrive app on your Android and iOS device. It’s compatible with different operating systems. 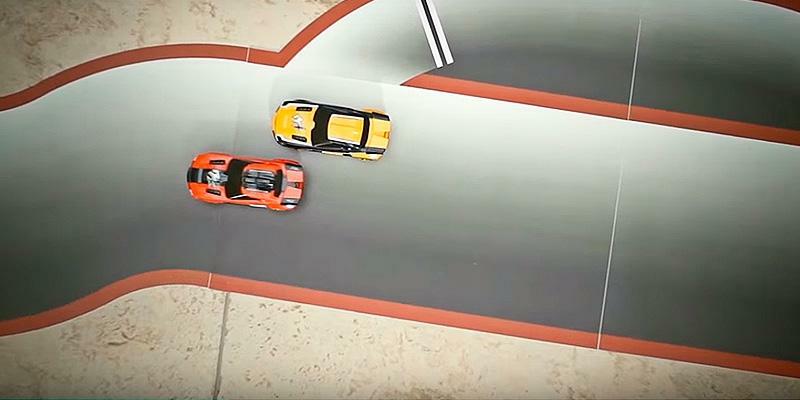 Moreover, up to 4 cars can race on the same track simultaneously. So, you can arrange a real championship! As an added bonus, you can view post-race statistics and change game modes in the ARC app available for free on the web. Slot car enthusiasts will definitely be satisfied with a great variety of available cars. Build a collection of your favourite vehicles with different driving capabilities and unique weapon! If you have your favourite cars from old Anki Drive collection, it could be of great use. The good news is that the Anki Overdrive supports all your old Anki cars in Open Play, Battle, and Race modes as well as in King of the Hill and Time Trial new gameplay modes. Let's See If You Can Make It to The Top! The Anki Overdrive Starter Kit allows you to choose from 5 game modes: Race, Battle, Time Trial, King Of The Hill, and Tournament. Thus, you may compete with each other or artificial intelligence (AI) as well as sharpen your racing skills in a single player mode. There is a special docking station for 4 cars that will charge the track in 8-10 minutes. The set includes vertical risers that allow building bridges and jump ramps for more fun. Also, there is a special tyre cleaner for the maximum control over the tires. Without any doubt, this slot car set will appeal to those consumers who are keen on advanced technologies and dynamic races. The assembly of the set takes just a few minutes, then you need to download the app, choose one of the supercars and here you go, a race can start. Now let's see if you can make it to the top! Elevation Kit to build awesome lifts and liftoffs for more challenging track and fascinating racing. Bank Turn Kit to add more twists for making your race more challenging while disabling your opponents. Nuke Expansion Car Toy - try out the new virtual weapons (Decimator, Disintegrator, Fuel Bomb) and increase your chances to win the race. Big Bang Expansion Car Toy - with such exclusive weapons as Power Stomp, BF-27, and Frag Mine, you won't give your opponent a chance to win. We'd like to present a digital slot car racing set by a well-known company Scalextric. Let's see what's the difference between digital sets and analogue ones. For a start, we should note that both types feature slotted tracks and bladed cars, while the cars of digital sets can swap lanes! Yes, they do. 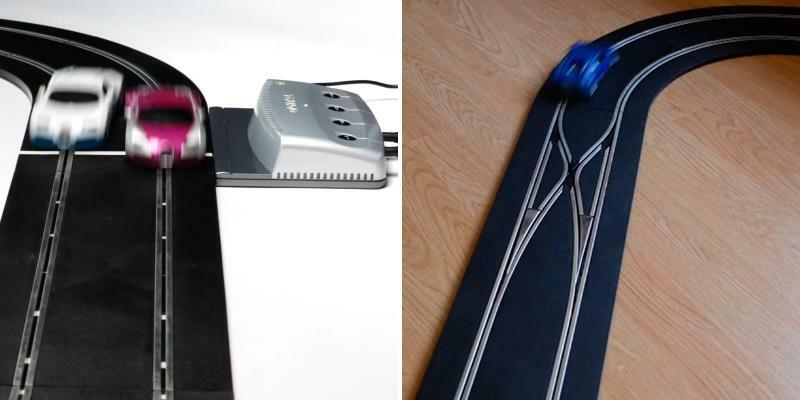 That's what slot car racers have been waiting for so long, and it's possible now with the Scalextric. The winning chances are higher on this racing set as it allows your car to run over the lanes of competitors and outstrip them when reaching the finish. However, mind that your contender can trick you in the same way. Another interesting feature of this digital set is that each lane can accommodate two and more cars. 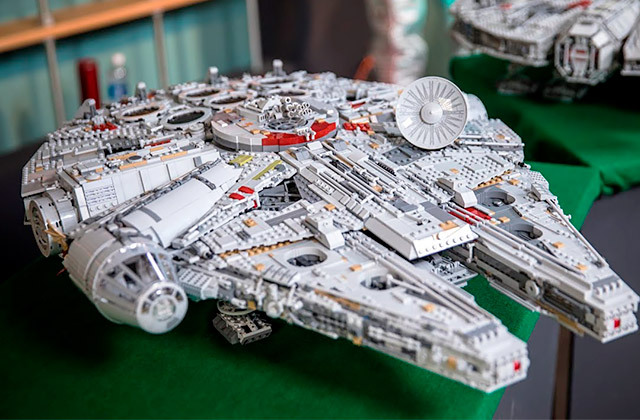 So, you'll be able to compete in a mind-boggling race with your friends or relatives. 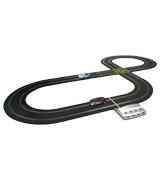 The track is 496 cm long, so you can fully enjoy racing two cars included in the set. These are purple and white 1:32 versions of Bugatti Veyron. 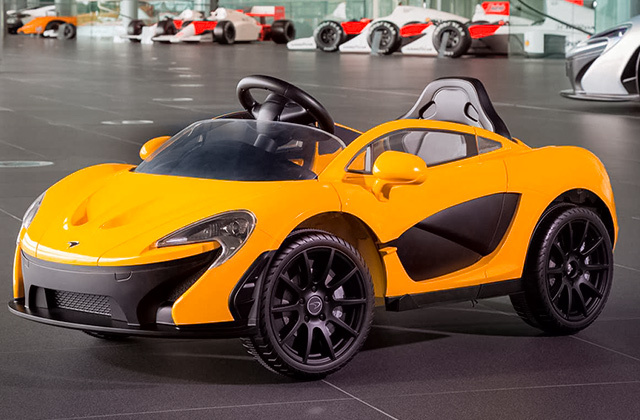 Hence, you'll be able to experience the power of these cars on the track. 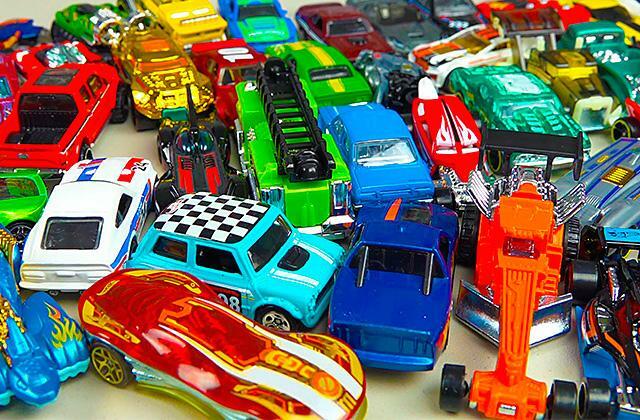 The shells of the cars are made of durable plastic, so don't worry about collisions and accidental take-offs. This set is also compatible with other slot cars. For instance, cars with DPR labelling (Digital Plug Ready) can be converted into digital models within a minute. You can also use older cars, yet you'll need to solder circuit boards to them, spending about 30 minutes of your time. All in all, we have reviewed the out-of-the-way racing set that integrates classical slot cars and digital technology and allows you to get a thrill and joy while playing and winning! It's time to review a classic example of a slot car set. This set features the analogue racing track which is compatible with a great variety of slot cars including old models with no upgrade. The track is 484 cm long and offers 4 different track configurations. The track can also be extended by adding a few more parts as well as columns used to support bridges and springboards. This way you can create a meandering path for all your friends or family to organize a real race. The kit comes with a counter to counts the laps which have been covered during your races. Speaking of the controls, the Scalextric set includes two hand controllers that offer both high and low speed settings. What else we think is great about this set is that it's easy for users to limit its speed to the desired one by adjusting controllers with a simple screwdriver. For kids, this may be the safest and the only possible option. The Scalextric set includes two slot cars - LMP and Pro GT, both made of heavy-duty plastic and well resistant to falls and drops. In the box you'll also find some stylish decals that you could decorate your slot cars with, making them look truly unique. This Scalextric set employs magnatraction, i.e. the magnets located on the cars' undersides. These magnets draw the cars to the track slots and, thus, provide an ultimate stability and traction even at the highest speeds. If you'd need more cars on your track, don't limit yourself - all other models available for sale will suit you well. Real FX Racing track features a unique track layout. So, what makes it unique? Unlike the majority of available models, the components of this slot car are made of microfiber PVC-coated fabric to ensure an incredible durability. Meanwhile, the car slot is lightweight, compact and wear-resistant. It's also very easy to put together, though it consists of 20 pieces. The evident advantage of the set is that it offers extreme versatility when it comes to making up track layout combinations. With 20 pieces, you'll be able to build and run up to 40 tracks! The set includes 2 cars both capable of developing speed up to 180 mph to provide more realistic racing. 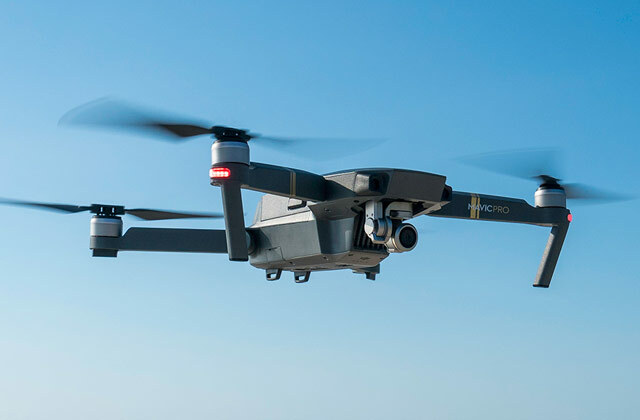 The cars are equipped with front and rear optical sensors that read the data from the track 200 times per second while artificial intelligence takes over control of the cars, preventing them from slipping off the track. That's impressive! The cars come with a set of 6 AAA batteries, providing up to 4 hours of continuous racing, which is, undoubtedly, a pleasant bonus. So, if the batteries run out of power in the middle of the game (which may happen indeed), you wouldn’t need to wait until the charging is complete. Replace the batteries and off you go! However, if the regular battery charge is not enough, you can simply use rechargeable batteries of the same type. This will provide a continuous racing for many hours, which will be a real fun! This slot car set implies setting up traps, both random and local, so just racing won’t lead you anywhere. You’d need to keep watching in order not to be trapped by other racers. What attracted our attention was a stylish design of a joystick in a form of a gun. It offers a good grip and easy-to-use control buttons along the sides. An embedded speaker informs of a current race and required settings. It's possible to update joystick drivers and game console to raise the race level. But there's more to come! The controller can be connected to headphones so you can keep on racing even at night still hearing all sounds and not disturbing the others. The car slot uses 3 AA batteries. Thus, this slot car is perfect for those who are bored of a classic race and want to focus on enemy attacks and a bit aggressive gameplay. Real FX Support - Windows and MacOS apps for track modification. Crossover Set - make awesome round tracks with a variety of twists and turns. 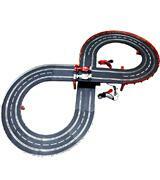 Expansion Track Set - build slot car tracks with outstanding overpasses and bridges to make your race more thrilling. The deAO racing set offers users some indisputable advantages over other models. Firstly, it’s come all pre-assembled and ready-to-use, so you can build up a track and start a race right out-of-the-box. Secondly, it’s not bound to electricity or battery power - the energy source is generated by your hands. Hand controllers with a rotary lever are triggered by swinging; the faster you swing the unit, the quicker your cars will move. 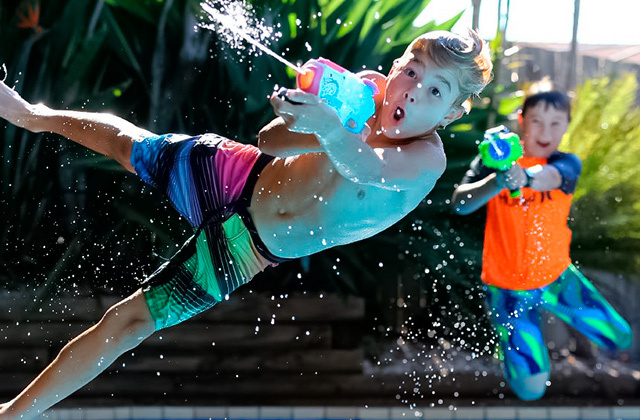 This way it’s possible to kill two birds with one stone - have a lot of fun together with your kids and help them develop mobility and coordination of hands. The package includes two slot cars (1:59 scale) that look like real F1 racecars, so you can bring a part of this world-known race to your home. The overall dimensions of the track at 95 x 44 х 18 cm make it a compact unit that can be easily set on a table or bed instead of the floor. It's also possible to fold it and put in a bag if you, for example, want to take it to a park or bring to your friend's place. 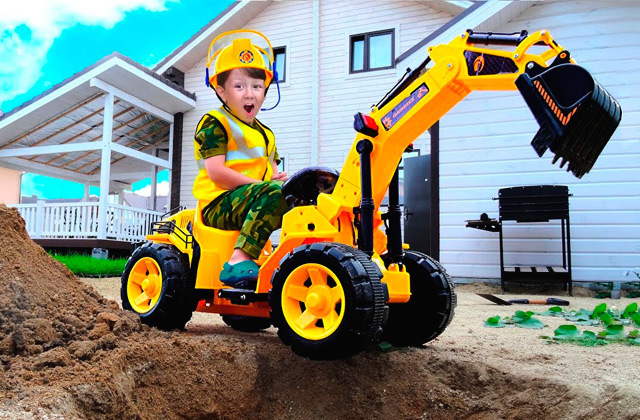 The deAO racing set is surely one of the best gifts that you can give your kid for a birthday. If your child's curious and loves discovering new things, this set will help him/her develop some great skills through the exciting game. Ready, set, go! Racing has always been one of the most common forms of entertainment and kinds of sports. When you go racing, you get an intense adrenaline rush and pulse-pounding excitement that trigger your competitive spirit. It goes without saying that a victory brings an incomparable satisfaction accompanied with a feeling of pride. A car racing is an entertainment exclusively for adults. And what about kids? A slot car simulator was designed for children to feel the thrill of a real race driving, yet except for the dangers racers usually face. Curiously enough but even adults hold slot car championships, so slot car racing a very popular pastime. Actually, slot cars are a mini version of real race tracks with miniature cars and a variety of additional track curves. You can drive cars with a joystick or manage races wirelessly via your smartphone. Also, you can choose from a variety of available game modes. For instance, select a single mode to practice your racing skills or a championship mode to add multiple players to a race. Below, you will find out the key features that should be taken into account when selecting the best slot car. 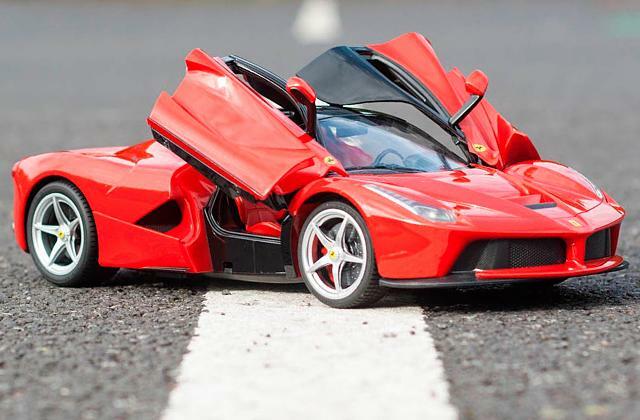 Children and their parents should also take a closer look at the RC cars to try their hand at higher levels of racing as well as car toys for amusing playtime. First of all, you need to find out the type of a race track. Originally, slot cars took their name from the technology used in their production. They were mains powered and had special slots that allowed cars to move on a track. However, technological advancements helped replace an old complex mechanism with rechargeable batteries. 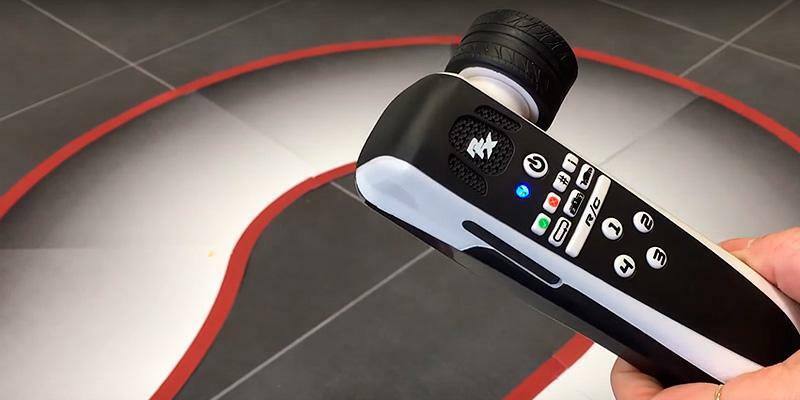 It allows you to manage races wirelessly via your smartphone or tablet, set up race modes, make virtual traps for your opponents, and share your results on social networks. 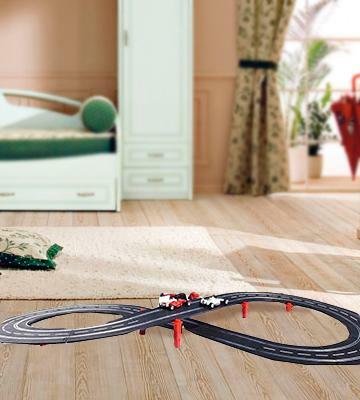 Moreover, new slot car tracks offer the freedom of movement. Thus, cars can freely move along the whole track instead of following the same route. As you can see, slot car tracks have a more limited motion path, yet cars move at higher speeds due to small magnets that provide the attractive force, keeping vehicles from flying off the track on the curves. 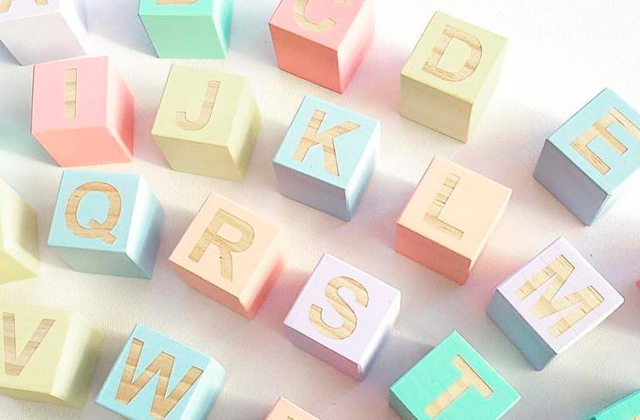 Besides, these magnets allow cars to make a loop that will definitely delight your child. Whatever a slot car set is, the track sections available will be one of the key factors while choosing a slot car. Sure enough, if you have only one track section, you will get bored with the game pretty quickly. And with a number of options, you can change tracks every day! 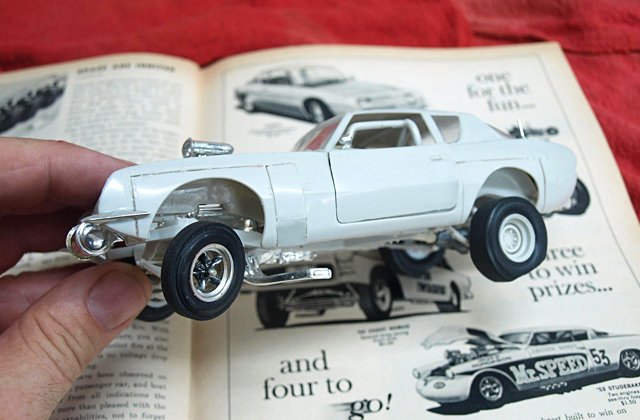 The assembly also plays an important role in the choice of a slot car. Analogue models can be attached to a surface with grooves, clicks or magnets. Digital models can also use these attachments, but there are ones, which can be set up on a floor, carpet, table or any other solid surface. 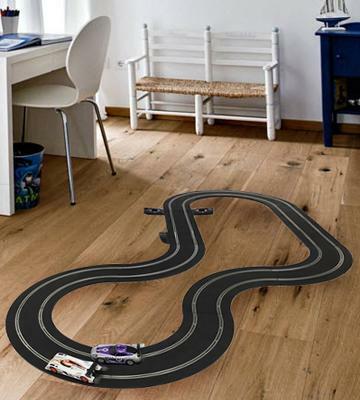 Depending on the track type, there are analogue or digital slot cars. Analogue slot car track sets are designed to match the track exactly. Small cars are ideal for high-speed battles while larger cars ensure a more realistic racing both for children and adults. Digital slot car track sets move freely along the whole track, still, they may not fit into the tracks made by other manufacturers. Besides, there are many different types of slot car controls. For example, analogue slot cars are guided with a special joystick (remote) connected to a central track block. 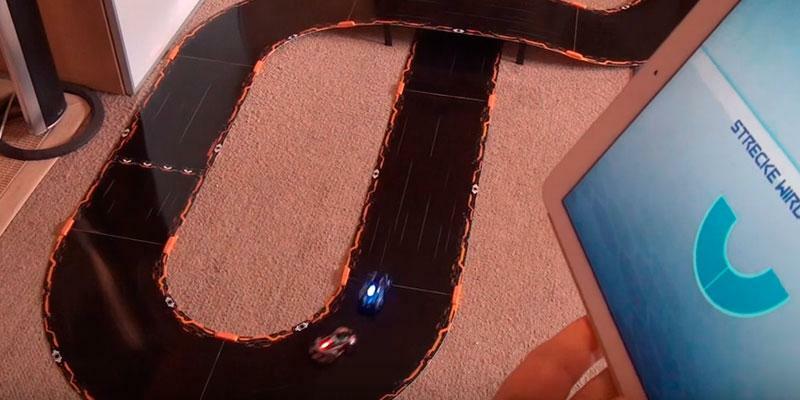 And digital slot cars are controlled by radio frequency signals or via Wi-Fi or Bluetooth. To make races more diverse, manufacturers made it possible to select tracks and game modes. Thus, you can arrange an exciting race for your children and their friends. They can train their driving skills by using a single mode or compete with computer opponents using digital models. In addition, digital models have some extra features like entering pit stops for fuelling and tyre replacement. Besides, you can set traps or shoot your opponents while racing. All the features mentioned above, make racing even more realistic and dynamic. 1. How to Choose the Right Scale for Slot Cars, eBay. March 3, 2016. 2. Slot Cars Buying Guide, eBay. March 3, 2016. 3. Christopher Neiger How Slot Car Racing Works, HowStuffWorks. 4. Slot car racing, Wikipedia. October 15, 2016.